I thought I was the only one around here who loves simple cakes, but apparently my coworkers share my opinion: this orange cake got devoured in a couple of hours and was elected their favorite baked good – who would imagine that orange could beat chocolate and caramel? Start by making the cake: preheat the oven to 180°C/350°F. Butter and flour a 32.5x22.5x5cm (13x9x2-in) metal baking pan. Sift flour, baking soda, and baking powder into a medium bowl. Using electric mixer, beat the sugar and butter in large bowl until blended and smooth. Beat in the eggs, one at a time, then orange zest and vanilla extract. Mix in flour mixture in 4 additions alternately with yogurt in 3 additions. Mix in orange juice. Spread the batter in the prepared pan and smooth the top. Bake cake 50-60 minutes or until risen and golden and a skewer inserted in the center of the cake comes out clean. Cool completely in the pan over a wire rack. 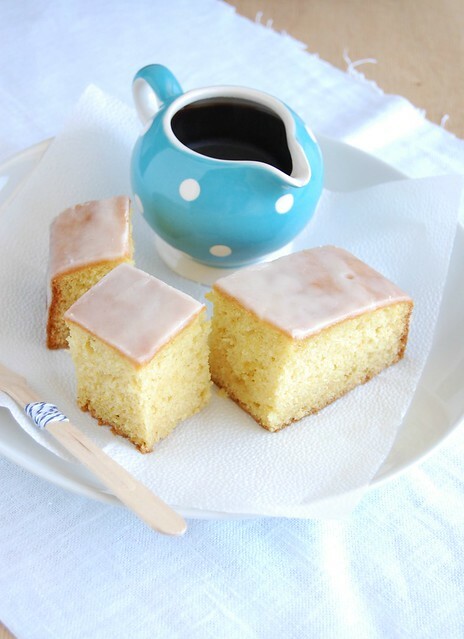 Make the icing: sift icing sugar into a small bowl, add the juice gradually and mix until desired consistency. Drizzle over the cake*. Cake can be kept in an airtight container, at room temperature for up to 2 days. I don't think it is possible that I could love this more than your lime cake, but I'll certainly give it a try (a side-by-side taste test might be in order...like I need an excuse to make these cakes). Sounds delicious...sometimes simple is best. Give me citrus any day over chocolate!!!!! Keep on posting the good food. Classic cakes are always the best...especially when shared and with a cup of tea! Great job! Lovely cake, it seems so light ! Sounds like a perfect tea cake. And I love tea time!